Saturday, December 18th, 8pm - 4am, 19+ ! 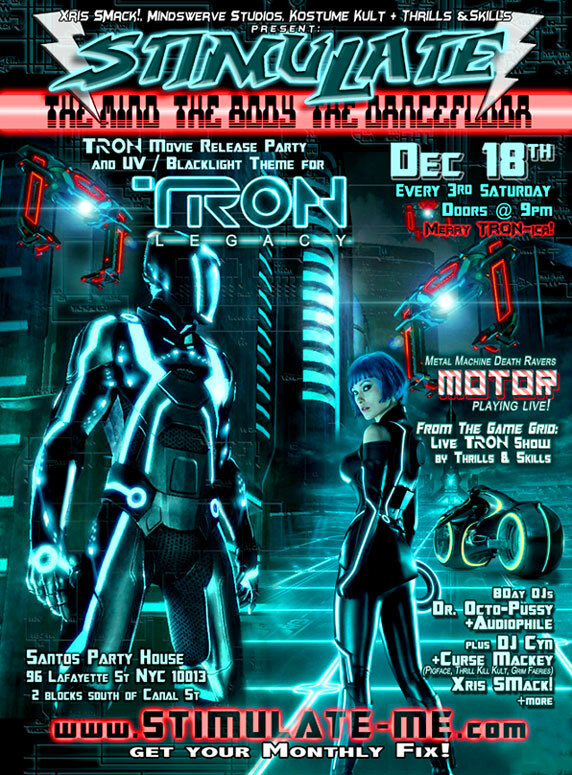 A futuristic, UV/blacklight themed TRON LEGACY FILM RELEASE PARTY paying homage to the 1982 cult classic film and the long awaited sequel that opens in theaters on Friday 12/17. An evening of Music, Dancing and tremendous Visuals including and actual Tron Light Cycle, themed performances and NYC's most stylish people. from Propaganda Games - Be a Part of The Game! UV/ Blacklight clothing painting by Brandon and Matt... Wear or bring something you want altered with a tech-circuitry pattern or anything else! Cyber Metallic play Equipment provided by fIXE Fetish. Tron past, present and future. Blacklight+UV reactive fashions, glowing electronics, cyber, steampunk, industrial, video game, electro-luminescent wire, rubber, plastic, latex and neon body paints. The club will be bathed in blacklight and decorated like the inside of the Tron game grid - so please plan and participate! :Lightcycle, TRON, TRON Legacy, Xris SMack!